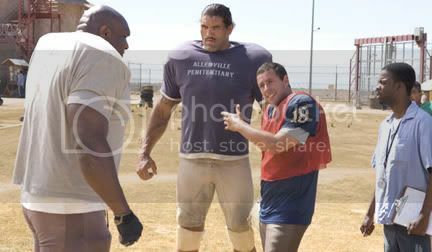 I have been an Adam Sandler fan for the longest time, but somehow I never really anticipated "The Longest Yard". Maybe his childish jackassery really doesn't appeal to me anymore. No, that's not it. Ok, now I remember. He's no longer the same childish jackass we knew and loved. This has been very obvious since Mr Deeds. He has long left 'the Billy Madison way' in favor of more viewer friendly characters. Incidentally, this has been proven good for him since people still queue in the theaters to see him kiss Drew Barrymore instead of getting beaten the crap out of by Bob Barker. The Longest Yard, In case you don't know, is a remake of Burt Reynolds' 1974 original. Burt Reynolds is also in the cast, along with Chris Rock and a cast of very talented (William Fichtner,James Cromwell ), reasonably talented (Tracy Morgan,Nicholas Turturro) and extremely untalented (Nelly, Stone Cold Steve Austin) actors. Paul Crewe (Adam Sandler) is a washed out NFL player who gets arrested and convicted for driving under the influence in his girlfriend's (Courtney Cox) Bentley, (which was reported stolen by the girlfriend). He gets convicted and is slated to serve 3 years in the Texas State Pen. Little does Crewe know that a special arrangement was made by the jail Warden Hazen (Cromwell) with the state to have Crewe in his prison for him to start a football team among the inmates fit enough to fight his guards, led by the sadistic Captain Knauer (Fichtner), who, themselves, are pretty popular in the semi-pro circuit. The movie is about Crewe along with the selected prisoners for the team overcoming trials and oppression brought about by the guards themselves in preventing them from becoming the great team they were to become. Like the original (which I haven't seen, by the way) it is very gritty and testosterone charged. A lot of shaky cam effects in the main game climax scenes make some shots look Any Given Sunday outtakes. Chris Rock's character Caretaker was almost unnecessary and Rock does not provide sufficient sympathy points for you to care that he gets killed in a pivotal point in the movie (yes, I'm spoiling it. Don't worry, you wouldn't care). However, there were some good one liners in it that will be echoed by kids in the near future and that's what Sandler's movie's are about. Good jokes, screw the story. The Sandler fan in me recommends this movie, that's about it. One of the great things about the Internet is that it gives everybody the opportunity to introduce themselves. If you, as the Blog owner, have no objections I would like to introduce myself to your readers. I've seen this one. It was hilarious! Adam wasn't that funny. The other freaky characters- like the Sasquatch- were. Just goes to show that physical deformity isn't enough to be funny anymore. Is this a sign that humans are actually evolving? I'm not really a Sandler fan, although I LOVE Billy Madison and like Happy Gilmore very much. But I really think Sandler suffers from playing the same sad-sack-who-must-redeem-himself loser in every movie he makes. I think the reason for this is that he surrounds himself with the same "creative" team for every one of his movies (uses the same rent-a-directors and co-stars). You see a real difference when Sandler works with a "real" director (such as Brooks in the underrated Spanglish or P.T. Anderson in the excellent Punch-Drunk Love). When his comedic yes-men are out of the way, you see that he can actually act. But in my opinion, he actually has too much of a hand in the creative process to be that funny anymore. 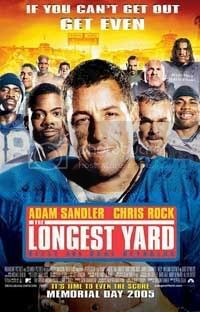 Oh, and I saw the original Longest Yard recently, and was underwhelmed to say the least. I think a remake was prudent, just not by Sandler. Should have had Alexander Payne or David O. Russell or someone quirky do it. Sandler is indeed a little too old for his schticks and would need a little help from good directors to reinvent himself. I have seen Punch Drunk Love and Spanglish ( wehich are not Adam Sandler movies, but movies with Adam Sandler in them). I would love Alexander Payne directing Sandler and I heard that Quentin tarantino is cansting sandler in his Dirty Dozen tribute "Inglorious Bastards". It is a disposable movie. I was surprised at how fun the remake was, although it is a superficial kind of fun. It lacks the dark undercurrents that made the first one so good. This is one of the best films I've seen in my life, with beautiful cinematography, excellent acting, and most importantly, a great script.